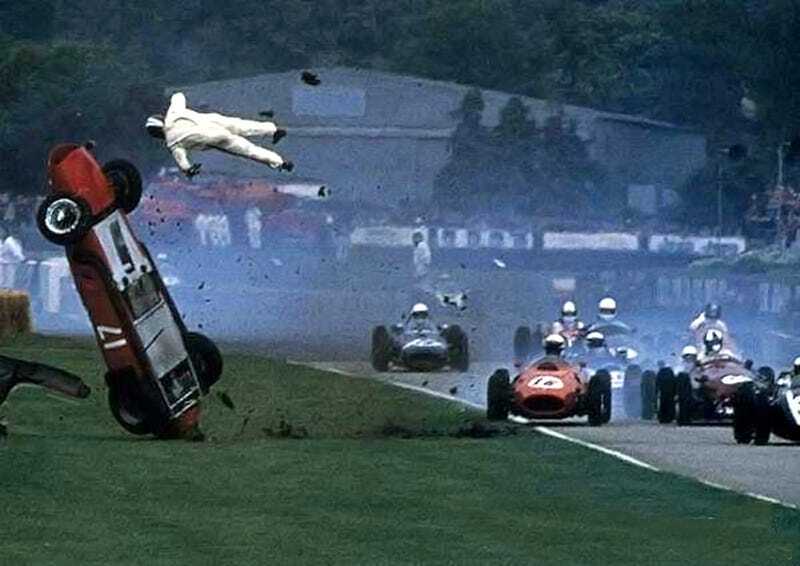 The 34-year-old Nigel Corner was thrown from his 1960 Ferrari Dino after a collision during a race meeting but amazingly escaped without permanent injury, despite breaking 17 bones. Now he is expected to make a full recovery and has vowed to get back on the track again. The dad of two, from Leyburn in North Yorkshire, said: "I remember changing from first to second gear and there was just a contact with another car. Unfortunately that led to my car turning sharp right and my last thought was 'Oh dear, I have got a real problem." "I don't remember anything else until they tried to pick me up from the side of track and the pain started. "I get a few flashbacks and I wake up and can't breathe but when I see the photograph it is like it was someone else." The crash left Nigel, managing director of an office furniture firm based at Croxdale near Spennymoor, with 12 broken ribs, broken collar bone, shoulder and bones in his neck. But the most serious injuries were punctures to both lungs, which started to fill with blood. Medical staff at the Goodwood circuit were on the scene within seconds and put a drain into his side to take away the blood and allow him to breathe, almost certainly saving his life. And, despite spending four weeks in hospital and complications including a collapsed left lung after he returned home, he is expected to make a complete recovery. He said: "I will never be as lucky again in my life. To have that accident and go up that high and not at least put myself in a wheelchair, I was very lucky. "I feel I have got to get back racing. I enjoy it and it gives me as big a thrill as anything I have done - I don't want to walk away from it. "But if I get in a car and I'm not as quick as I used to be and I don't like it, I will walk away without a backward glance."